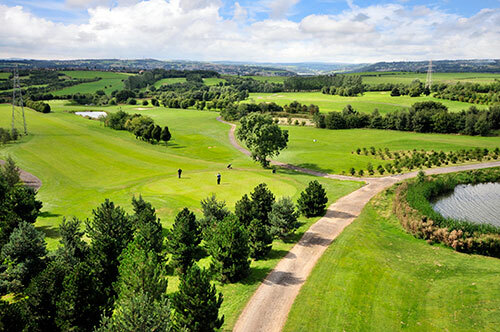 With 50 holes to play, Willow Valley Golf is the one of the largest golf facilities in Europe. An incredible 14616 yards of golf! The Championship Willow Valley Course has been designed to capture the imagination of proficient golfers. With heavily bunkered fairways and greens, combined with testing water hazards on 11 of its 18 holes, the course can challenge the most experienced golfer. The Willow valley Course hosted the Yorkshire PGA Championships until 2013. the tournament has had several high profile winners including the past Ryder Cup champion Gordon Brand. Our intermediate Pine Valley course is of interest to golfers of all abilities. An 18 hole course measuring 5154 yards off the competition tees. The course has been designed with undulating U.S.G.A. greens, to allow players to run the ball onto them rather than having to fly the ball through the air. There are lakes and bunkers placed to catch only the most wayward shot. The Fountain Ridge course is built to the same U.S.G.A. standards as the Willow Valley Course. Comprising of six par 3 and three par 4 holes it is ideal for those who are not yet ready to play our other courses or for golfers with restricted time. This course is a perfect 9-hole addition to any golf day as a warm-up for the 18 hole challenges ahead. Our floodlit 3-hole Academy course is great fun and also a fantastic facility to hone your pitching skills. Playing from real grass tees to well scaled target greens, you will soon develop an eye for judging distances up to 80 yards. This 18 hole course measuring 5154yards off the competition tees will be of interest to golfers of all abilities. With a very competitive greenfee, Pine Valley offers a modern design and great value for money. Built to the same U.S.G.A standards as the Willow Valley Course the 9 hole Fountain Ridge Course has six par 3 and three par 4 holes and is ideal for those not yet proficient enough for the challenge of Willow Valley or with less time to spare. 3 short holes of 55, 65 & 75 yards ideal for practicing your pitching, chipping and putting. The area of the game we most recommend you practice if you want to lower your your scores. We have a spare on on both Willow Valley and Pine Valley.